Travis Wood has spent the past five seasons with the World Series champion Chicago Cubs. KANSAS CITY, Mo. — Just a week ago, Royals general manager Dayton Moore sat deep within Kauffman Stadium and admitted that he was probably finished building his starting rotation ahead of spring training. He decided Monday that there was one more move to make. The Royals and left-hander Travis Wood agreed to a $12 million, two-year contract, a person familiar with the negotiations told The Associated Press. The person spoke on condition of anonymity because Wood still needed to pass a physical for the contract to become official. 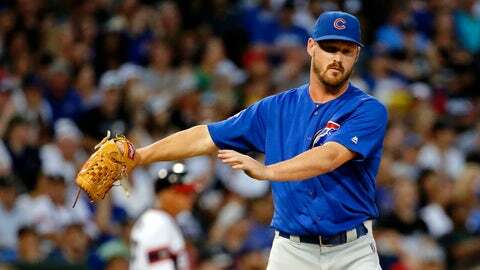 The 30-year-old has spent the past five seasons with the World Series champion Chicago Cubs, first as a starter and then working exclusively out of the bullpen last year. But he will be given a chance to earn the fifth spot in the Royals’ rotation behind left-handers Danny Duffy and Jason Vargas and right-handers Ian Kennedy and Jason Hammel. The thought was that Kansas City would open the final spot in the rotation to competition among a handful of promising young pitchers. But signing Wood gives them some flexibility; his bullpen history means he could provide important relief innings. Wood had a 2.95 ERA out of the bullpen last year, and tossed 6 1/3 innings of relief during the Cubs’ championship run. Wood even earned a victory in the Division Series against San Francisco. The Royals have mined the Cubs this offseason as they aim to build on their 81-81 finish a year ago and return to the World Series, which they reached the previous two years. Along with signing Hammel and Wood, they also shipped All-Star closer Wade Davis to Chicago for young outfielder Jorge Soler. The spending spree for Hammel and Wood late this offseason was made in large part because of the tragic death of Yordano Ventura. The 25-year-old flamethrower, expected to anchor their rotation for years, was killed in a car crash in the Dominican Republic last month. The Royals were expected to be bit players in free agency this offseason, and Moore acknowledged that the payroll may have to be cut after it established a franchise record last season. But the deals for Hammel and Wood, combined with a $12 million, two-year deal for designated hitter Brandon Moss, means the Royals could eclipse $140 million in payroll for the second straight year.